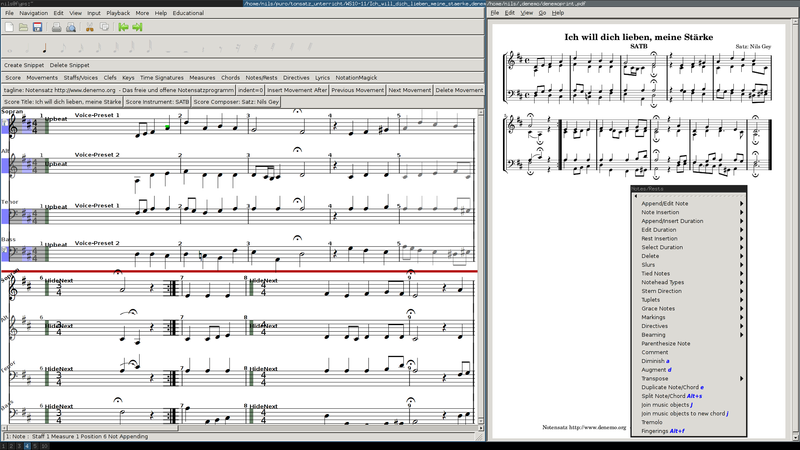 Denemo is a free music notation program for GNU/Linux, Mac OSX and Windows that lets you rapidly enter notation which it typesets using the LilyPond music engraver. Music can be typed in at the PC-Keyboard (watch demo), or played in via MIDI controller (watch demo), or input acoustically into a microphone plugged into your computer’s soundcard. 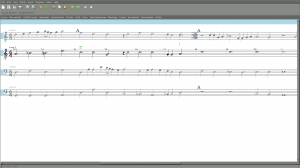 Denemo uses LilyPond which generates beautiful sheet music to the highest publishing standards. During input Denemo displays the staffs in a simple fashion, so you can enter and edit the music efficiently. The typesetting is done in the background while you work, and is generally flawless publication quality. 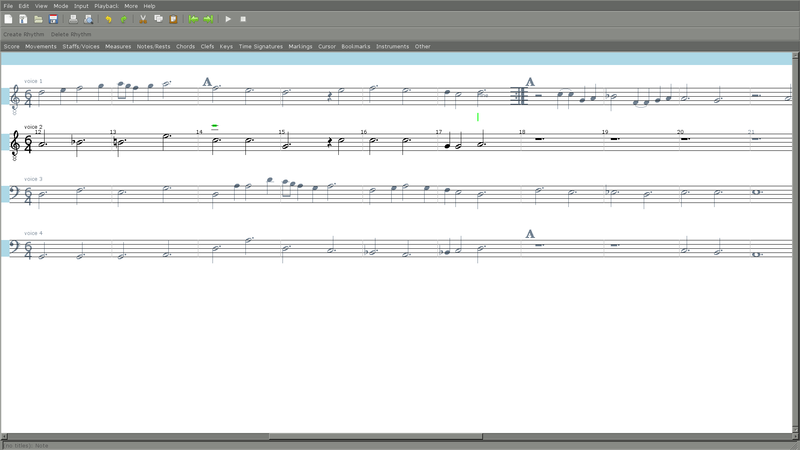 Some final tweaks can be done on the typeset score with the mouse if needed (watch demo). This represents an enormous practical improvement over the popular programs which require you to re-position colliding notation constantly as you enter the music. See comparison with Musescore, Finale or Sibelius. Another great feature is the ability to put links in the score to the original source document that you transcribed from. Clicking on such a link opens the document for you and highlights the bar you are looking at. You can use this to continue work from where you left off, or for looking back at the source to check a doubtful bar. 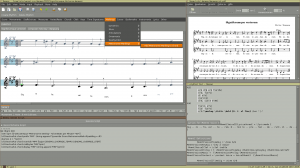 Beginner to Professional: Denemo can be used for a brief student homework all the way to a full-scale opera. 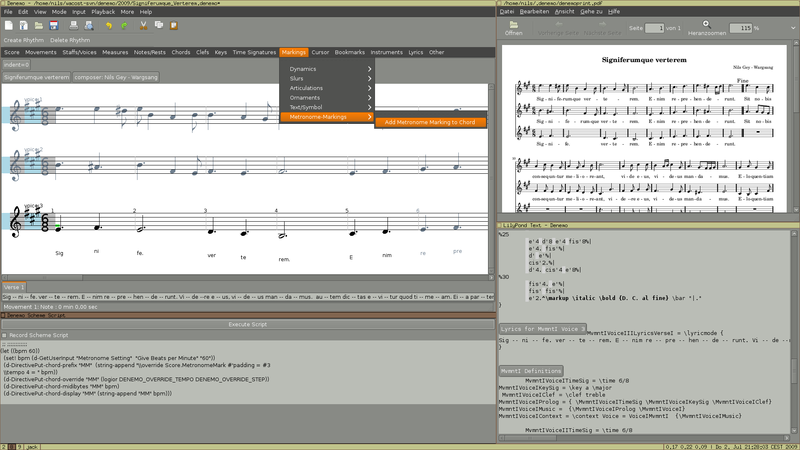 Support is there for creating the widest range of notation – Tablature, Chord Charts, Fret Diagrams, Drums, transposing instruments, ossia, ottava, cue, title pages, table-of-contents, critical commentaries, footnotes quoting music, and more with LilyPond’s extensive syntax available for even more demanding uses. 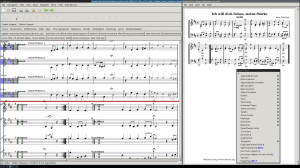 In Brief: Denemo is a free (GPL) music notation editor, creating notation straight from your input that outshines the commercial competition (comparison with other score writers). You can compose, transcribe, arrange, listen to the music and much more. Watch a demo (and some other demos). Release 2.2 is out now. Release 2.2 is imminent – please test!. Release 2.1 is out now. Release 2.1 is imminent – please test!. Release 2.0.14 is out now. Release 2.0.14 is imminent – please test!. Release 2.0.12 is out now. Release 2.0.12 is imminent – please test!. Release 2.0.10 is out now. Release 2.0.10 is imminent – please test!. Release 2.0.8 is out now. Release 2.0.8 is imminent – please test!. Release 2.0.6 is out now. Release 2.0.6 is imminent – please test!. Release 2.0.4 is out now. Release 2.0.4 is imminent – please test!. Release 2.0.2 is out now. Release 2.0.2 is imminent – please test!. Release 2.0 is imminent – please test!. Release 1.2.4 is out now. Release 1.2.4 is imminent – please test!. Release 1.2.2 is out now. Release 1.2.2 is imminent – please test!. Release 1.2 is out now. Release 1.1.8 is out now. Version 1.0.6 is imminent – please test! Release 1.0.2 ia imminent – please test!